Game Freak | Superhero etc. Hello interweb, Nate here! Oh, I said in the last post that I’ll do the SuperheroSins episode to DKR Pt 2? I lied! Now I’m a fan of Pokemon, Marvel, DC, Sci-Fi, Fantasy, etc. But I’m also kind of a science nerd. Because of this, sometimes I like to try and use real world science to explain things in fiction. Granted, most things in fiction usually ignores science because if superheroes were restricted to real world science then they wouldn’t be nearly as fun. However, it’s fun for me at least to try and explain fiction using real world science or at least compare them. I really don’t know why this is but I can’t be alone considering that YouTube channels like Game Theory exist as well as books like James Kakalios’s book The Physics of Superheroes is an actual published book at any library or book store. One of my favorite subjects in science is evolution and it’s a topic that I really wish I knew more about then I do currently. In addition to my fascination with evolution, I’m a huge fan of the popular video game/anime/trading card game/manga Pokemon! 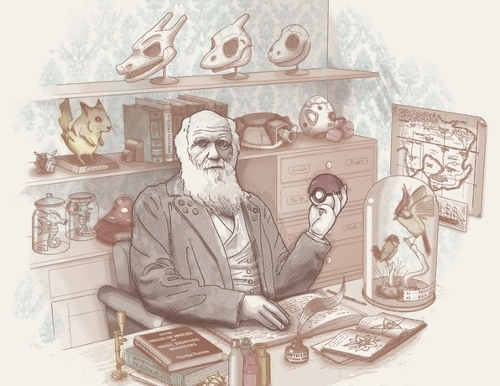 So I decided to write this essay in order to compare Pokemon evolution to Darwinian evolution and look at the evidence give to use from the various Pokemon medium to ask the question of if Darwinian evolution occurs in the Pokemon universe. Disclaimer: While I am fascinated by the subject, I am no expert in evolution. In addition, while I am a huge fan of the franchise, I do not know everything about Pokemon. Therefore, I very well may make various mistakes in this article and I encourage others to correct me whenever possible. Also, I was quite proud of this so I decided to turn this into a semi-formal essay. So I hope you enjoy!